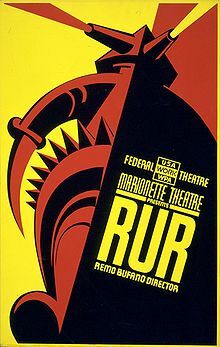 A 1939 poster for Karel Čapek's play, R.U.R. (1921) in which he coined the word "Robot"
Today in 1984, a factory robot in Jackson, Michigan, crushed a 34 year-old worker in the first ever robot-related death in the United States. The robot thus violated Issac Asimov’s First Law of Robotics, “A robot may not injure a human being or, through inaction, allow a human being to come to harm,” first articulated in 1942. Today, Robots have gone beyond the factory and thousands of Kiva Systems cute orange Robots safely run around warehouses fulfilling our online orders. Three years ago, “Roboticist” Rodney Books predicted: “[In the 1950s, when I was born] there were very few computers in the world, and today there are more microprocessors than there are people. Now, it almost seems plausible that in my lifetime, the number of robots could also exceed the number of people.” He must have had in mind some specific catalysts that will cause rapid acceleration in the proliferation of Robots — at that time (2008), the world’s Robot population stood at 8.6 million. Growth catalysts such as South Korea’s plan to put a Robot in every home by 2020. This entry was posted in Artificial Intelligence, Predictions, Quotes, This day in information. Bookmark the permalink.